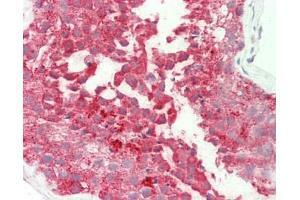 Human Testis: Formalin-Fixed, Paraffin-Embedded (FFPE). This image was taken for the unconjugated form of this product. Other forms have not been tested. Immunogène Synthetic peptide from C-Terminus of mouse Gyg (Q9R062, NP_038783). Percent identity by BLAST analysis: Human, Gorilla, Gibbon, Monkey, Marmoset, Mouse, Rat, Panda, Bovine, Bat, Pig, Opossum, Guinea pig, Platypus (100%), Rabbit, Seabass (92%), Galago (85%), Turkey, Chicken (84%), Zebrafish (81%).